Summary: T-Mobile has the perfect data-centric plan for Walmart customers — unlimited data at 4G speeds, unlimited text and 100 minutes of voice for just $30 — but will it have the phones users want? As someone who barely ever use my smartphone for voice calls — I can’t seem to get a strong enough cellular signal in my concrete jungle — I simply cannot justify paying for multiple hundreds of minutes of voice that I know I could never use, on top of a requisite multi-GB data plan just so I can get the latest phone on the cheap (relatively speaking), and be held to a two-year contract that probably ends up costing me more than the phone is worth. 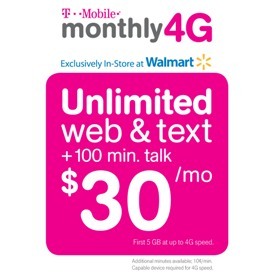 T-Mobile’s latest “unlimited” plan for pre-paid Walmart and T-Mobile.com customers seem to be perfect for someone like me: text and data heavy users who rarely use their phones for voice calls. It offers 4G speeds (HSPA+ with theoretical speeds of 42 Mbps) for the first 5 GB of data and drops down to 2G speeds for the remainder of the month, which should be more than sufficient for most users, but that’s not all. For $30 every 30 days, this plan also includes unlimited text and 100 minutes of voice; if you need more minutes for phone calls, your per minute rate is only $0.10. You can even use this phone when you travel to both Canada and Mexico, albeit with roaming charges that are slightly more expensive than AT&T’s GoPhone roaming charges ($0.59 cents per minute for voice but just $0.10 per text within Canada via T-Mobile, versus $0.39 per minute for voice and $0.25 per text message from AT&T). The only thing keeping me from handing T-Mobile $30 this instant is the uncertainly over which phones are eligible for this plan. According to the press release, “Walmart is increasing its line-up of affordable T-Mobile phones to six, including the addition of Walmart’s first 4G prepaid handset,” while providing no hints on what this 4G phone may be or when it will be announced. To make matters worst, carrier-branded pre-paid phones are typically not the hottest phones, and the seven 4G T-Mobile phones I found on Walmart’s website aren’t inspiring me to pay unsubsidized prices for them: the myTouch 4G, SideKick 4G, HTC Sensation 4G, Samsung Galaxy S 4G, myTouch Slide 4G, BlackBerry Bold 9900, Samsung Exhibit 4G. If I’m able to use an unlocked GSM phone with this plan then I may have finally found the ideal smartphone plan for my needs. Those waiting to see what the new iPhone is all about before committing to a carrier has plenty of time to compare offerings: this plan won’t be kick in until October 16, and is exclusive to in-store and online Walmart customers, as well as T-Mobile.com customers. All I have to say is thank goodness for competition. Is T-Mobile’s new $30 Wal-Mart plan perfect for the heavy data user?